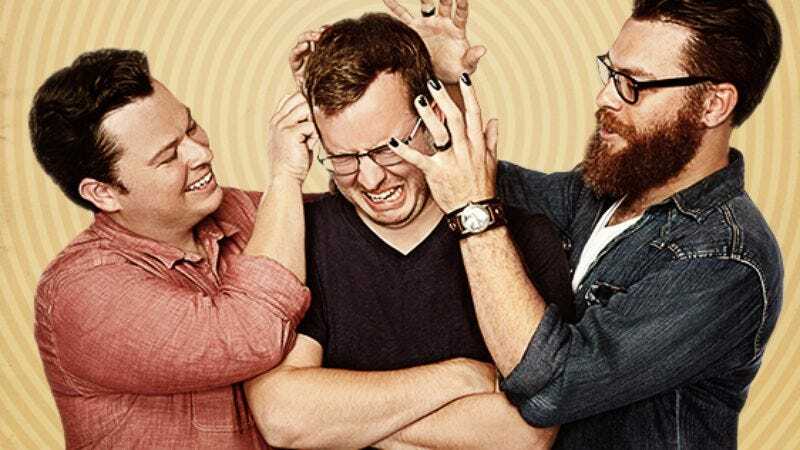 One of the running gags on the My Brother, My Brother And Me comedy advice podcast is the way real-life siblings Justin, Travis, and Griffin McElroy consistently fail to come up with meaningful ways to start the show. This often requires them to come up with spur-of-the-moment topics like the impending release of the Thor movie, one brother changing his name to Bliss Delight, or references to those trapped Chilean miners long after they had been rescued. So it seems appropriate that, for the first episode of their new Seeso series, the McElroy brothers would have a similarly difficult time figuring out how to open the show. In this exclusive clip, the brothers are initially caught off guard by the simple fact that they actually have to make a TV program, but after a few takes—and a request to replace the cameras with a technology that will allow them to reach into viewers’ rooms for some reason—they settle on a predictably ridiculous approach. My Brother, My Brother And Me will premiere on Seeso on February 23.